Aubrey Reynolds is a small-town girl who’s made it big. A successful Hollywood director, Aubrey doesn’t have time to linger on what could have been. But when a routine blood test comes back with a false positive, she decides to take some time off to do the things she’s always wanted to do: taste the famous chocolate chip cookies at the Minnesota State Fair, hike the Grand Teton National Park, scuba dive in the Caribbean. But after Aubrey admits to herself what she’s really missing, she heads back home to Dusty Valley, Oklahoma... and the man she left behind. Aubrey is a fun, successful movie producer who loves her life. But when facing her own mortality, she finds that despite all of her success, she has a major regret. In order for her to achieve her dream, she had to leave behind the love of her life. So, while on her quest for adventure, she finds herself back in her hometown to see if she can explain and achieve some closure with her first and only love, Cole. Cole is a down-to-earth fireman who loves his family and his job. His one regret is that he never got to marry the love of his life, Aubrey. Even though he knows that she needed to leave in order to be as successful as she is, he still is angry with her for leaving and not allowing him to come with. This is a sweet, second-chance romance where the characters have old history that leads them through to a new lease on life. They go on an adventure to reconnect and find their love again. It was a sweet story, but I actually was more interested in Cole's brother and Aubrey's friend's romance. I hope they get their own story. I really enjoy secondchance romances and this one did not disappoint. Aubrey and Cole had to find their way past the hurts of the past to be able to enjoy the present. I enjoyed the way their characters interacted with each other and you could feel the emotions rolling off the page. Aubrey Reynolds is living her dream, she is an award-winning, Hollywood director but when she gets bad news from her doctor, her world gets turned upside down. When she learns the results were wrong, she still decides to do some things she has always wanted to do, like go to a zoo in Washington, eat the chocolate chip cookies at the Minnesota State Fair, eat Pickle soup in St. Louis, and the one thing she can't stop thinking about is going back home to make thing right with the only man she ever loved. Cole Haywood was her best friend, boyfriend, and the man she was about to marry before she left him to follow her dreams. While Cole has lived in the same small town his whole life, worked on the family farm and worked at the local fire station since he was able. He can't believe that she is back after all these years. Can he forgive her and they move on? Will they be able to make a relationship together work or is the pain too deep? If they can't repair the damage, can they remain friends? Can they travel together and be able to forgive each other? Will there be a chance for them to finally have a future? I love a second-chance romance and this one is great. L.P. Dover has a way of bringing these two people back together with their friends and families that made the story even better to me. If you haven't read this author before, this one is a good start. I really enjoy L.P. Dover's stories, and always choose to read them, because the storylines are good – and this is no different. However, I do have to admit that sometimes the amount of telling rather than revealing can annoy me. There is a lot of scene setting, which I often feel could have been revealed within the story. As I say, overall I enjoy the stories, but sometimes have to get over the world building phase knowing it will be worth it once things get going. I say this in case you start and feel as I do. My advice is to continue, and you should not be disappointed. I enjoyed the fact that the successful director who left town was the female lead, and that the male lead had stayed at home to help out at his family's ranch. She was therefore wealthier, more likely to continue to be so, and in a usual storyline, these facts would have most definitely been reversed. Aubrey's brush with the possibility of death was the perfect way to give her the chance of setting her affairs in order, in the broadest sense, and sets her on a journey. This starts as one of exploring long desired locations, but soon changes to affairs of the heart, sending her back to her hometown. As she and Cole remember their past, they finally get to talk about what happened, and why... and more importantly, what might happen next. After the dramatic start (the lesson being never, ever get a diagnosis over the phone! ), the story wends its way through a sweet childhood and sorts out what really are one's priorities in life. I might point out that this is true for Cole as well as Aubrey! L.P. Dover is the New York Times bestselling author of the Second Chances series, the Breakaway series, the Forever Fae series, the Gloves Off series, the Armed and Dangerous series, the Society X series, the Royal Shifters series, and a standalone novel, Love, Lies, and Deception. She loves not only to write, but also to play tennis, hike in the mountains, go white-water rafting, and sing. A Southern belle with a former life in periodontics, L.P. Dover lives in North Carolina with her husband and two beautiful girls. 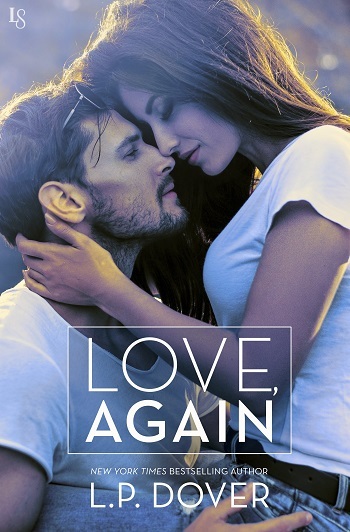 Reviewers on the Wicked Reads Review Team were provided a free copy of Love, Again by L.P. Dover to read and review.